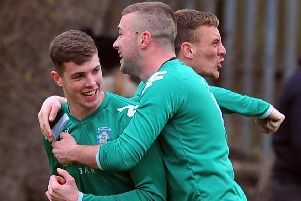 THE close-knit feel within the dressing room at Pool must continue if they are to beat the odds and avoid relegation from the West Yorkshire Premier Division. The team currently sit bottom of the table after no wins in their last three league games, but club secretary Peter Wilkinson refuses to give up hope with the positivity around the team. “I must say what a bunch of players we have got,” he said. “They are so positive. We were all together after the Leeds City game at the weekend and looking at the results around us which didn’t go our way, they were still trying to work out how we can stay up. “Many would have given up at this stage, we are rock bottom and it’s an almost impossible task to avoid relegation, so they deserve a change of luck. “If we can somehow win the next six or seven games it’s possible but we are realistic, we know it will need something as dramatic as that. What is even more frustrating for everyone at Pool is the fact that they are celebrating their 50th year anniversary this season. “It’s Sod’s Law that in our 50th year the first team are bottom of the Premier Division,” explained Wilkinson. “There was football in Pool before and after the war, but then during the severe winter of 1962/63 in February, Pool St Wilfrid’s were that far behind with their fixtures that they folded. “Then on July 12, 1968, there was a meeting held with the purpose of forming a new club to be called Pool AFC which duly happened, so we are 50 years old on July 12 this year so on July 13, with all our old members welcome to join us we are having what is most likely to be an informal dinner. “We have booked the village hall so there will be a function with entertainment and plenty of quiet time at Pool Sports and Social Club to discuss the last 50 years. Pool’s 2-1 defeat to Leeds City at the weekend may well have confirmed the club’s relegation to Division One, after rivals for the drop Hall Green United clawed their way to a 1-0 home win over title contenders Ilkley Town. The visitors saw the best chances of the match, with forward Adam Davey having two goals ruled out for offside before hitting the bar in the closing stages, but Ryan Barker secured all three points for Hall Green. Carlton Athletic picked up their third league win on the trot, defeating Horbury Town 3-1, while Robin Hood Athletic overcame Field in a 5-4 thriller. Two goals for James Finlayson and strikes from Chris Coupe, Lewis Richardson and Daniel Bridges were enough to lift Robin Hood to seventh. Beeston worked for their 4-3 win at Shelley despite Shelley seeing red cards for Nathan Addy and Robert Bartram. Whitkirk Wanderers continued their relentless form in Division One, recording their 10th league win in a row against Leeds Modernians with a 2-0 victory, writes JAMIE WOODHOUSE. Rawdon Old Boys remain hot on their tail, however, following their 4-1 thrashing of Boroughbridge, while Featherstone Colliery also stay in the title picture, after beating Rothwell 5-2. With East End Park not in action, Wyke Wanderers took advantage to latch back on to the promotion chasing pack, with goals from James Acton and Karl Fawcett giving them a 2-1 win over Wetherby Athletic. Oxenhope Recreation defeated Altofts 5-1 in a relegation six-pointer, while Aberford Albion moved to within three points of eighth-place Kippax after thrashing them 8-1 at Kippax Welfare Sports and Social Club. Division One’s bottom clubs Howden Clough and Brighouse Old Boys met at the weekend, with Howden securing a 3-0 victory to move four points clear of Brighouse. In Division Two, the games between Baildon Trinity Athletic and Old Centralians and Huddersfield YMCA and Knaresborough Celtic were both postponed. All was not lost, however, as the top two – Kirk Deighton Rangers and Otley Town – were both in action. Otley ran out comfortable 4-0 winners over Newsome, but Kirk Deighton overpowered third-place Swillington Saints, 3-0, to remain top of the table.